Several factors determine the overall success of an eCommerce website; for example, product quality, shipping costs, trustworthiness, and customer service. However, great user experience design is also key to providing customers with a satisfying experience. It will not only convert potential clicks into actual eCommerce transactions but also cause customers to come back time and again. Toptal is a marketplace for top E-Commerce website designers. Top companies and start-ups choose Toptal Web designers for their mission-critical design projects. Serge is a product designer based in NYC. Content, context, and the user are the motivating factors for all of his design decisions. He approaches design from the needs of the customer—putting them at the heart of his solutions. He's best-suited for roles in product design within a dynamic and collaborative team that values meaningful design. Above all, you’ll find him well-organized, extremely open-minded, and honest to work with. Fernando is a New York-based interactive art director with more than nine years of experience working for major brands in the U.S. as well as for global advertising agencies. He combines his knowledge as an art director in the fashion and luxury industries with current tech and web design trends. He's helped multiple brands from the ground-up building their identity and full online presence. For the past decade, Karim has been working in the industry and that combined with his innate eye for design means he can bring a lot to the table. His main expertise lies in UI/UX and product/interaction design. Karim likes to think of himself as a problem solver who carefully chooses the best tool to implement the right strategy, design, and interaction for his client. Gabriel is a passionate self-taught product designer with a focus on user-centered, visually pleasant designs. He has been working in this field for 10 years, doing agency and freelance work, with clients from all over the world, focusing on creating the best user experience for each business. João is a digital designer based in Portugal. For the past few years, he's been moving from advertising and marketing to a product-oriented path, having worked in various roles ranging from UI to visual design. During this time, he's also developed some brands and worked on photography and video projects. Danielle is a seasoned UX/UI product designer, specializing in the fintech market. Collectively she's helped companies raise over 18 million in seed and VC Funding in the last two years. Her interfaces have serviced over 100 million users. Data drive Danielle's designs and are often powered by React. She believes in staying lean and testing regularly. Danielle works well in small teams and with first-time founders. In 2017, eCommerce sales in the US alone are estimated to reach around $434 billion. 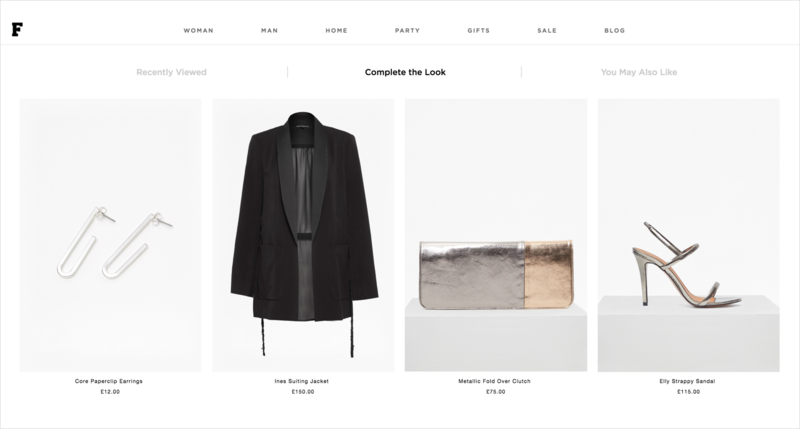 Here is a comprehensive guide to designing great eCommerce websites, complete with examples. First and foremost, it is important to design a website that shoppers feel they can trust. Most shoppers are concerned about privacy and whether the site will protect their personal data by providing a secure transaction. If the website does not feel trustworthy, they will simply choose to shop elsewhere. 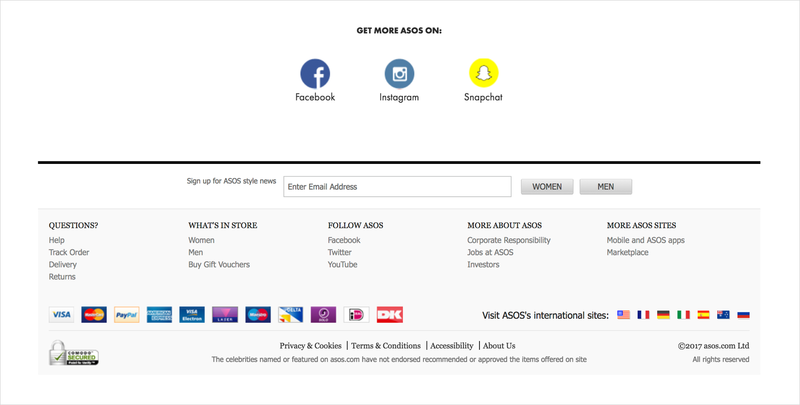 ASOS shares pertinent information about the business and secure payment solutions in the footer. Write in plain language and avoid legal or internal policy jargon. Share product reviews: Provide product reviews to help shoppers understand more about the product; this will help alleviate any concerns they may have. Take it a step further by offering product reviews along with additional information about the reviewers, or by summarizing the reviews. This step can help make it easier for shoppers to get the full benefit of others’ opinions. Use a secure server: Shoppers expect that their personal information will stay secure while they purchase online. SSL (Secure Sockets Layer) certificates authenticate the identity of a website and encrypt information that needs to remain safe. It is an essential sign that indicates checkouts are secure. Assure shoppers that their data is protected by implementing SSL and displaying SSL certificate badges. Add recognized trust seals: A trust seal verifies the legitimacy and security of a website. Some trust companies even add an extra layer of protection by offering some insurance if the transaction turns out to be fraudulent. Using recognized trust seals convinces potential shoppers of a secure transaction process, which leads to increased sales. Show attention to detail: Make the website look legitimate and professional by avoiding typos, missing images, broken links, 404 errors, and other mistakes. The look and feel of a website is the main driver of first impressions. Research concludes that people will determine whether they like a website or not in just 50 milliseconds. Follow the brand identity: The branding should be apparent throughout the website. Choose colors that reflect the brand, and set the style in order to make clear what type of products are sold. Ensure that brand experience is consistent across all channels, whether online, in-store, or on a mobile device. This will help build a strong brand-customer relationship. Adopt visual hierarchy: The most critical content should be displayed above the fold. In some cases, using less whitespace to bring items closer together is better than pushing critical content below the fold. Do not over-design: Limit font formats such as font face, sizes, and colors. When the texts looks too much like graphics, it will be mistaken for an ad. Use high-contrast text and background colors to make the content as clear as possible. Stick to known symbols: Use icons or symbols that are easy to identify. Unfamiliar icons will only confuse the shoppers. A good way to avoid any possible confusion is to provide labels for icons. Avoid popup windows: Popup windows are a distraction. Even if they contain valuable information, shoppers are more than likely to dismiss them immediately—once gone, even if they want to, it’s hard for shoppers to find the information again. The top level of navigation should show the set of categories that the site offers. Group products into categories and subcategories that make sense. Category labels work best as single words that describe the range of products so that shoppers can scan through them and instantly understand what they represent. Make it omnipresent: Put the search box on every page and in familiar locations. The box should be visible, quickly recognizable, and easy to use. Standard positions to implement the search box are the top right or top center of the pages, or on the main menu. Support all kinds of queries: Searches need to support all types of queries such as product names, categories, and product attributes as well as customer service related information. It’s a good idea to include a sample search query in the input field to suggest to shoppers the use of the various functions. Have auto-complete functionality: Auto-complete functionality makes it easier for shoppers to find what they are looking for and increases sales potential by suggesting things within the area they are already searching. Sportsgirl allows sorting and filtering of search results. 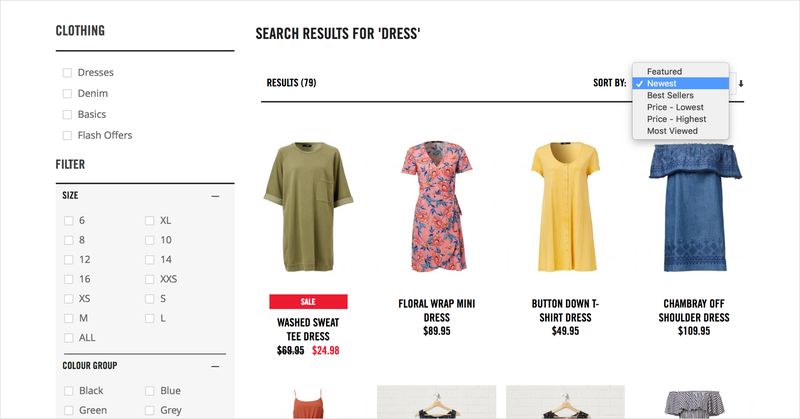 Allow sorting and filtering of results: Let shoppers sort search results based on various criteria (best sellers, highest or lowest price, product rating, newest item, etc.) as well as eliminate items that do not fit within a certain category. The more choice given, the harder it is to choose. Help shoppers find the right products by implementing filters. It will help them narrow their choices and jump to their desired product range directly. A “quick view” reduces the time it takes for shoppers to find the right product by eliminating unnecessary page loads. Typically, the product details are displayed in a modal window over the viewed page. Do not try to show all the product details; instead, include a link to the full product page to view complete details. Also, be sure to include a prominently positioned “Add to Cart” button as well as a “save to wishlist” functionality. Shoppers always look for special offers, discounts, or best deals. Make exclusive offers visible so shoppers know about them. Even if the price differences aren’t that great, the psychological sense of saving some money creates an illusion of having an upper hand. When shoppers successfully find the product they want, let them find out about the product. 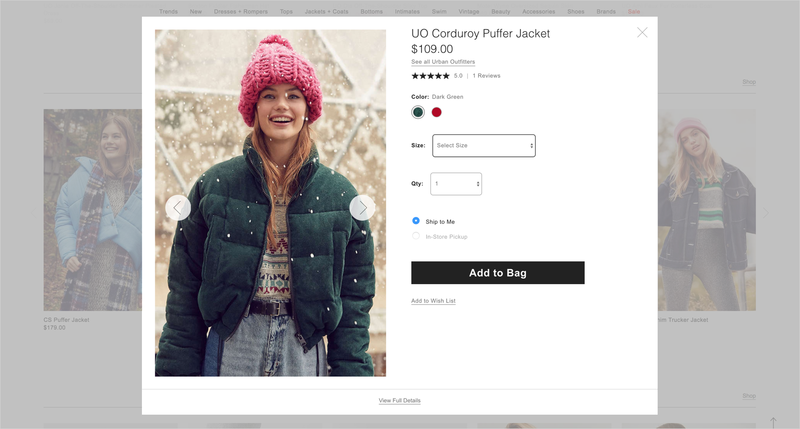 Design a product page that creates an experience that is as similar to an in-person shopping experience as much possible, by including lots of images, detailed descriptions, and any other useful and related information about the product. Let’s take an in-depth look at what this means. 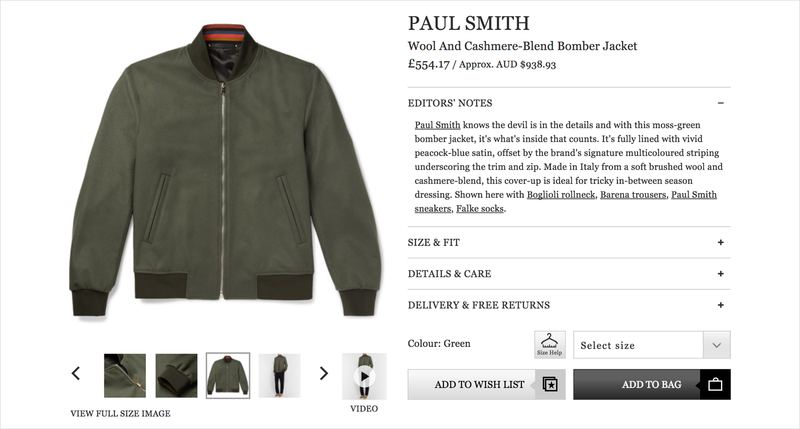 MR PORTER's product images include a zoom feature and even a video. Use a white background: The background for product images should not distract or conflict with the product itself. A white background works best because it allows the product to stand out and works with almost any style or color scheme. Use high-quality, large images: Good images sell the product. High-quality images catch shoppers’ interest and show them exactly what they are buying. Having large images lets shoppers zoom up and examine a product in fine detail. Use various images: Display the product from a number of different angles and include closeups in order to provide a more complete sense of the product. A 360-degree view, where they can move the product around, is a good way to provide an experience close to physically going into the store and engaging with it. VR eCommerce is the next wave of this experience. Use a video: Videos have the ability to deliver a lot of information in a short amount of time. Use a video to show the product in use, and to provide as much functional information as possible. Be consistent: Use images that are consistent across multiple pages and are also in line with the look and feel of the rest of the website. This will keep everything looking clean and uncluttered. The main product image should be the same across all areas of the site, such as product highlights or in the featured items section. Give shoppers detailed information about the product so they can make an informed purchase decision. Show availability, options for different sizes or colors, dimensions, a size chart, materials used, total cost, warranties, and more. The fewer remaining questions they have about a product, the more likely they are to make a purchase. 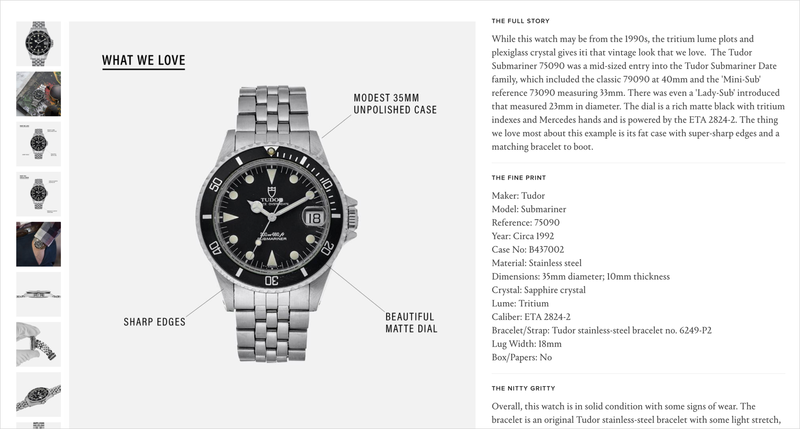 HODINKEE shows detailed product information. According to the scarcity principle, humans place a higher value on an object that is scarce and a lower value on those that are abundant. Create a sense of urgency in the sales process by showing scarcity—display how many products are left, grey out sizes that are out of stock, or show sale deadlines. Scarcity will motivate potential buyers to take action. Increasingly, companies are using advanced psychological research, and in order to drive more engagement and purchases, have turned what used to be an art into a science. 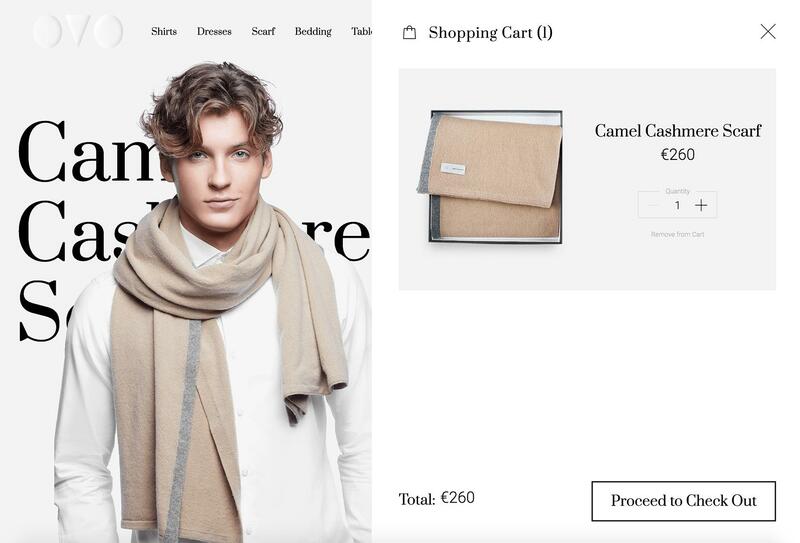 Persuasive design in eCommerce is a very effective way to garner more purchases. THE ICONIC offers real-time stock information. Display similar products that shoppers might also like that work well with the current product or products that others purchased. This can be displayed on a product detail page or in the shopping cart and will help guide shoppers to the products that meet their needs and potentially encourage them to continue shopping—a great way to cross-sell related products. French Connection displays complementary and recommended products. The shopping cart is essential, as it is where shoppers review their selected products, make the final decision, and proceed to checkout. The primary goal of the shopping cart is to lead shoppers to checkout. Below are tips on designing a shopping cart that is user-friendly and which will encourage shoppers to purchase further. Clear call to action (CTA): The primary call to action on the shopping cart page should be the checkout button. Use bright colors, plenty of clickable areas, and simple language to make the checkout button visible, straightforward, and easy to use. Provide adequate feedback: Make sure when a product is added to the shopping cart that it is immediately and clearly confirmed. Shoppers get confused by inadequate feedback, such as showing inconspicuous confirmation text. A good idea is to use animations, as movement attracts the human eye. Use a mini cart widget: Allow shoppers to add products to their cart without leaving the page they are on by using a mini cart. It also allows them to navigate, discover, and add more products. Mini cart widgets should always link to the full-page shopping cart. Display product details: Displaying details like product names, images, sizes, colours, and prices in the shopping cart helps the shoppers remember each product as well as compare products. Link products in the cart back to their full product pages so that shoppers can review more details when necessary. Make the cart easily editable: The ability to remove, save for later, or change details like size, color, or quantity should be easy to access. Avoid the surprise of unexpected shipping costs and taxes: Unexpected shipping costs are one of the leading reasons shoppers abandon their shopping carts. Place shipping options and taxes with precise calculation of the costs and an expected delivery date up front. Offer various payment options: Different shoppers have different preferences when it comes to making payments. Cater to as many payment options as possible (contingent on the target audience) to expand the customer base and to make it easy for shoppers to complete their order. Keep it simple: Minimize the number of fields and steps to complete the purchase. 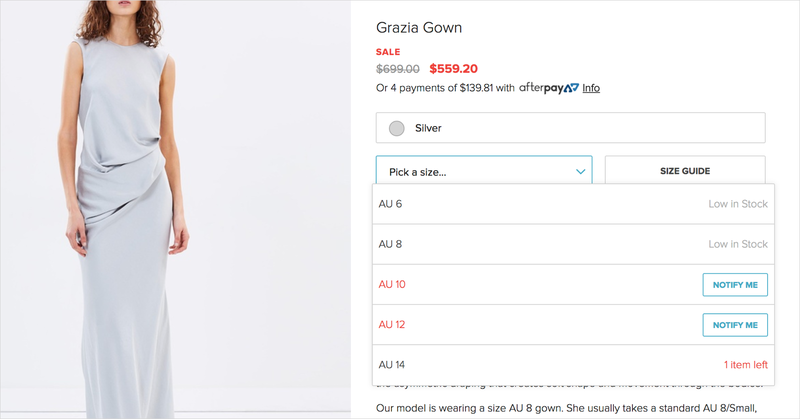 Using shipping address as billing address by default is a good way to minimize the number of fields—ideally, design a single-page checkout where shoppers can view their cart and enter delivery and payment information. 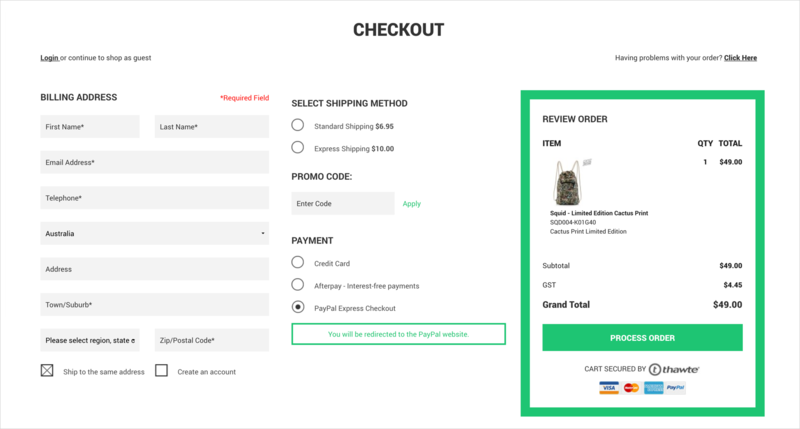 Crumpler has a single-page checkout with an option to shop as guest. Make registration optional: Forcing shoppers to create an account prior to their first purchase will drive the shoppers away. Give them an option to register after the purchase is complete and highlight the benefits of registration when asking them to register. Benefits include faster checkout thanks to personal information like saved shipping address or payment information as well as access to exclusive offers that are only available to registered members. Use clear error indications: There is nothing more frustrating than not being able to make a purchase and having to guess at why. Instead of showing the errors after a form is submitted, make error notifications that come up in real time. Place clear and concise error messages directly above or next to the item that requires correction, so shoppers will notice them immediately. Lululemon shows that a three-step process is all it takes to complete a purchase. Keep them on track: When using a multi-page checkout, include a progress bar that shows how many more steps are left to complete the purchase. This will eliminate any ambiguity and assure shoppers they are on the right track. When the purchase is complete, display an order confirmation and order status with shipment tracking. Offer support: Include a live chat or contact number throughout the checkout process, so when shoppers have questions, they can quickly get answers rather than having to leave the site and go elsewhere. When designing an eCommerce site, it is not just about building a website but also creating an online shopping experience that will convert passive shoppers into paying customers. Use this guide to make essential design decisions in order to build a website that is professional, attractive, user-friendly, and makes shoppers come back for more time and again.